RAMESWARAM, INDIA, February 27, 2019 (Deccan Chronicle): Several hundred thousand pilgrims from different parts of India are expected to congregate in Rameswaram for the coming Shivarathri festival on March 4 this year, as it is a rare occasion with astronomical significance reappearing after 54 years. The Shivarathri Punyakaalam this year is accompanied by the transits of the planets of Guru, Sukran, Rahu and Kethu, and such a phenomenon is occurring as per the Hindu almanac after 54 years, said the chief priest at the Sri Ramanathaswamy temple here, Sri Chandrasekhara Sarma. "Offering worship to Lord Shiva on this Shivarathri on such an occasion will confer all possible benefits to the devotees," explained Sarma, adding, due to this rare astronomical combination with its astrological implications, a heavy rush of pilgrims, particularly from North India was expected for the festival this year. The 12-day festival, which began on Monday, has lined up special pujas each day and as part of the festivities, the processional Deities of Lord Ramanathaswamy and his consort Parvathavarthini Ambal, were taken in a procession on the four Mada streets around the temple today on the second day. Hundreds of people came out of their houses to have darshan of the Lord. 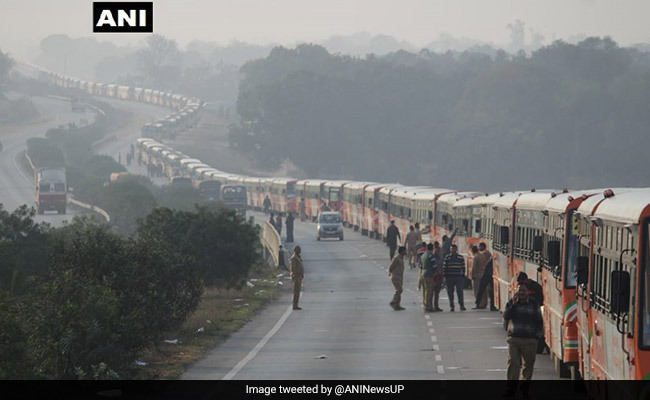 At Kumbh Mela, UP Eyes Guinness Record for "Largest Parade of Buses"
PRAYAGRAJ, INDIA, February 28, 2019 (NDTV): By rolling out a fleet of 500 buses at the ongoing Kumbh Mela in Prayagraj, the Uttar Pradesh government is eyeing to break an existing Guinness World Record. The record of largest parade of buses is currently held by Abu Dhabi of 390 buses. A 3.6 mile-long convoy of 390 buses had travelled a stretch of 2.5 miles on the Sheikh Khalifa bin Zayed Highway in Abu Dhabi. The record attempt was to celebrate UAE 39th national day. The Uttar Pradesh State Road Transport Corporation (UPSRTC) buses will cover a distance of over 2 miles. The parade of the saffron-colored buses will be held at NH-19, between Sahson toll and Nawabganj toll plaza. "The parade is also to demonstrate the traffic plan which worked very well during the ongoing Kumbh Mela where 3200 acres of land was used for parking of vehicles," Additional Chief Secretary (Information and Tourism) Avaneesh Kumar Awasthi told news agency IANS. According to an official, the parade of 500 buses would be the longest anywhere in the world. A couple of observers from the Guinness Book of World Records will witness the record-making attempt on the route on which buses will run. Hinduism is such a joyous religion, freed of all the mental encumbrances that are prevalent in the various Western faiths. It is freed of the notion of a vengeful God. It is freed of the notion of eternal suffering. It is freed from the notion of original sin. It is freed from the notion of a single spiritual path, a One Way. INDIA, February 24, 2019 (opindia.com): Hinduism and its reach are noticeable in the immediate neighborhood, with a deep influence on Sri Lanka, Bangladesh, Bhutan & even Burma. However, in South East Asian countries such as Cambodia, Indonesia, Laos, Mauritius, Malaysia, Thailand, Singapore, Vietnam; the influence of Hinduism is even more obvious. Hinduism has also spread to other corners of the world and is followed in many more countries globally. Across the world, Stamps are used to honor a nation's heroes, momentous events, symbols and culture. Stuck on envelopes, they travel the far reaches of the country as well as across the world and propagate their message. The Hindu Deities have similarly managed to assimilate themselves in the popular culture of many countries and have found a place on the face of many stamps. Country after country expressed pride in their association with the principles, symbols and stories of Hinduism. Must see collection of very cool stamps issued around the world at "source". The major way a family person makes spiritual progress is by fulfilling all duties--duties to spouse, duties to children, duties to parents, duties to community. When we fulfill our duties as best we can, we make spiritual progress. We don' have to go anywhere else. We don't have to give up our duties and spend time in a cave. HOUSTON, TEXAS, February 21, 2019 (Houston Chronicle): Gopal Aggarwal recently returned home to Sugar Land from what is the largest faith gathering in the world -- the Kumbh Mela, a Hindu pilgrimage held every three years in India. "Kumbh Mela is a wonderful, big festival of unity," Aggarwal said. "I love it. It's a wonderful blessing." He and his wife, Uma, were among more than 120 million religious devotees who headed to Prayagraj during the 48-day festival to participate in the sacred ritual of bathing in the Ganges River. Aggarwal recalled with wonder how a temporary city basically sprung up inside of Prayagraj, formerly known as Allahabad. Mystics and devotees alike chanted Vedic mantras, prayed and shared blessings, music and meals. Gopal Aggarwal has been attending the event since 1989 in one of the four alternating cities where festivities are held, all located on the banks of a river -- Haridwar on the Ganges, Ujjain on the Shipra, Nashik on the Godavari or Prayagraj at the confluence of the Ganges, Yamuna and the mythical Sarasvati. Kumbh Mela is held once in each city on rotation every 12 years. The destinations of the pilgrimages are based on astrological positions, as well as spiritual tradition. The 2019 bathing dates began on Jan. 15 and will continue through March 4. Sarath Menon-Chembottil, professor at the University of Houston, specializing in the sociology of religion and the cultural, economic and social consequences of globalization in India, said that being immersed in the water rids individuals of impurities. The tragedy of human history is that there is decreasing happiness in the midst of increasing comforts. 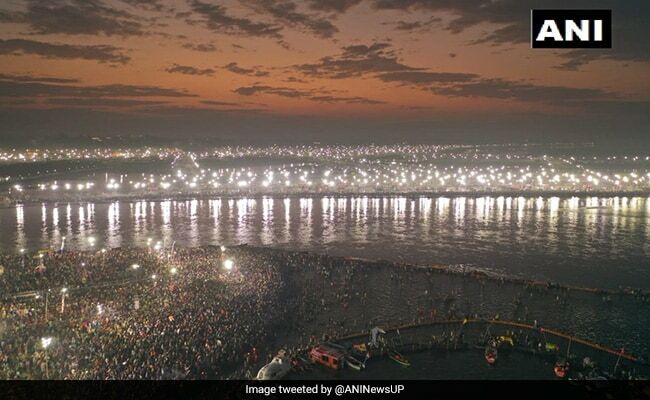 PRAYAGRAJ, INDIA, February 20, 2019 (NDTV): The devotion of pilgrims at the confluence of the holy rivers Ganga, Yamuna and the mythical river Saraswati gave way to some breathtaking pictures from Kumbh Mela on the occasion of Maghi Purnima. The stunning aerial visuals of the holy occasion have been shared by news agency ANI on Twitter. 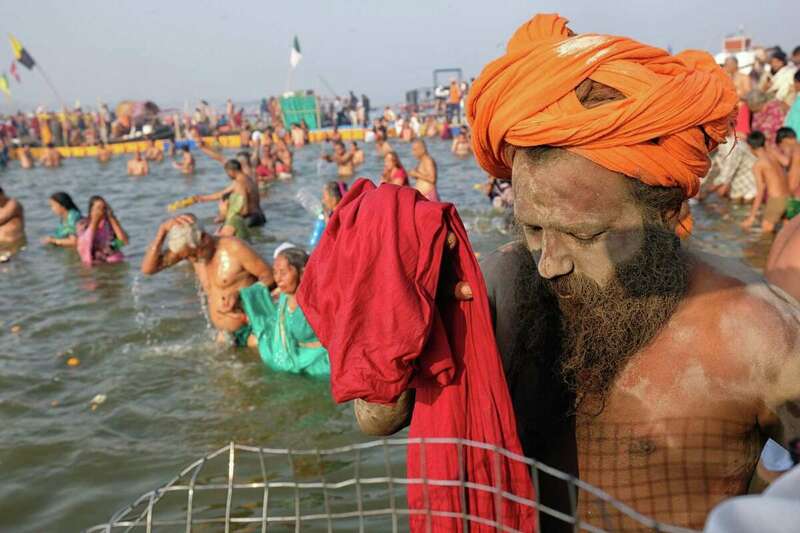 Hundreds of thousands of devotees took a holy dip at Sangam on the auspicious day of Maghi Purnima which marks the end of the month-long penance period of Kalp Wasi pilgrims, known to be the most faithful ones at the Kumbh Mela. They vow to live an austere and minimalist life on the banks of the Ganga for a month. Elaborate security arrangements have been made for the heavy rush of people that started arriving in Kumbhnagar since Monday night especially after the Pulwama terror attack of February 14. The officials expect over 10 million devotees to participate in the fifth royal bath of the Kumbh Mela this year. As many as 40 bathing ghats have been prepared to manage the crowd. Though not a shahi snan, or royal bath, Maghi Purnima like Paush Purnima and Maha Shivratri, is called a parv snan and is part of the six important bathing days during the Kumbh. Traditionally on Maghi Purnima, pilgrims today and tomorrow worship Guru Bhrasapati with the belief that Hindu God Gandharva travels from the heavens to Sangam. INDIA, February 20, 2019 (The News Minute): The Tirumala Tirupati Devasthanam (TTD), the body which oversees the Venkateswara temple atop Tirumala, unveiled a budget of approx. US$438 million for 2019-20 and said that it was expected cash offerings alone to account for $173 million of the total amount. Speaking to reporters, TTD chairman Putta Sudhakar Yadav said that according to their estimates, the sale of tickets could fetch around $41 million, while the famed laddu prasadam may help the religious body take in around $38 million. According to the TTD's website, every day on an average, about 300,000 laddus are sold in Tirumala. The sale of hair, which devotees offer to the presiding deity, is another avenue for income for the TTD. The TTD chairman also said that around $88 million would be spent on paying the salaries of the staff who worked in the premises of the temple. 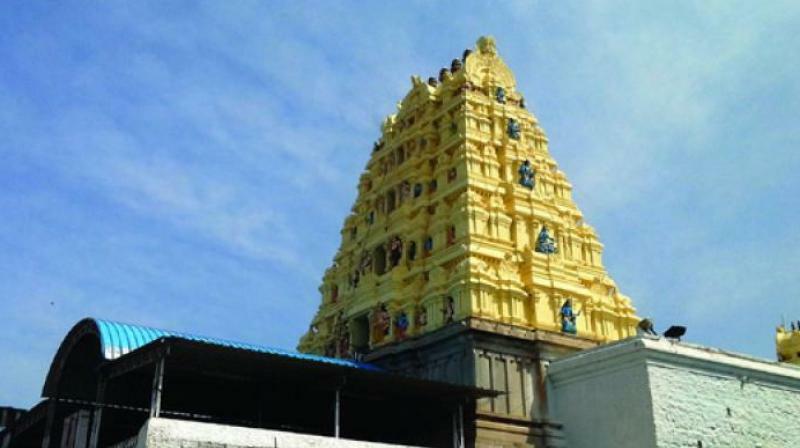 The TTD had approved an annual budget of $401.7 million for 2017-18 and have stated that the temple's earnings during 2018-19 are expected to be around $406.7 million, of which the offerings in temple Hundi are likely to be $162.5 million. During the financial year 2016-17, the TTD said that 26.8 million devotees visited the shrine. As the TTD deals with such a large amount of public money, devotees have contended that there should be more transparency in how the funds are spent by the body. There is a proverb in our language: "If want to be a hunter, I'll hunt the rhinoceros; if I want to be a robber, I'll rob the king's treasury." What is the use of robbing beggars or hunting ants? So if you want to love, love God. BALI, February 20, 2019 (Coconuts): Indonesian Hindu groups are once again urging authorities to cut off Bali's Internet supply during the holy day of Nyepi, which falls on Thursday, March 7, this year. Nyepi, which marks the beginning of the Saka New Year in Bali, is traditionally a time for silence and self reflection, during which work, travel, entertainment, and lighting fires are strictly prohibited. Last year, authorities complied with the requests by blocking mobile Internet data. Although ISPs were allowed to keep operating, they did block social sites like Facebook, YouTube, and Instagram. "The purpose of the termination of the Internet is the same as last year; so that Hindus can solemnly carry out Nyepi day," said the chairman of Parisada Hindu Dharma Indonesia, Bali, Prof. Dr. I Gusti Ngurah Sudiana, as quoted in detiknews. Sudiana expressed his belief that, in previous years, the distracting influence of social media had detracted from the true essence of the Balinese Day of Silence. "With no Internet last year, there were almost no defects during Nyepi. Hopefully, with the proposal of the Internet shutdown, the special requirements of Nyepi will be better executed, and the people in Bali will be more calm and peaceful, especially leading up to the 2019 election," he continued. According to a report by Bali Post, the final decision as to whether the island's Internet will be fully suspended has yet to be made. INDIA, September 21, 2017 (Quartz India by Vijay Prashad): In 1950, Aime Cesaire, one of the clearest voices of the 20th century, looked back at the long history of colonialism that was coming to an end. He wanted to judge colonialism from the ashes of Nazism, an ideology that surprised the innocent in Europe but which had been fostered slowly in Europe's colonial experience. After all, the instruments of Nazism--racial superiority, as well as brutal, genocidal violence--had been cultivated in the colonial worlds of Africa, Asia, and Latin America. Cesaire, the effervescent poet and communist, had no problem with the encounter between cultures. The entanglements of Europe's culture with that of Africa and Asia had forged the best of human history across the Mediterranean Sea. But colonialism was not cultural contact. It was brutality. Cesaire was adamant: Colonialism had produced nothing that would earn it respect in the scales of history. This was in 1950, when a few nations had just emerged out of the scar of colonialism, and when many societies fought pitched battles to extricate themselves from colonial power. The ugliness of colonial power in India emerged at its end, with callous policy by the British engendering the millions dead in the Bengal famine of 1943, and the million dead and millions more displaced in the Partition of 1947-48. It was harsh, too, when one considers that after centuries of rule, the British left behind a region with a literacy rate of merely 12%. Indian historians had looked back at the record of British rule in India to find economic and political policies designed to impoverish the country at the expense of Britain, with massive surpluses from India sucked into Britain to underwrite the industrial revolution, and to build a British military force capable of ruling the sprawling British empire. "India is to be bled," said the Marquees of Salisbury in the 1870s. So it was. Much more at "source" above. It is the nature of desire never to be fulfilled, but he who utterly gives it up is eternally fulfilled at that very moment. UNITED KINGDOM, February 15, 2019 (Bloomberg Opinion by Shashi Tharoor): The recent flap over Winston Churchill -- with Labour politician John McDonnell calling Britain's most revered prime minister a "villain" and prompting a rebuke from the latter's grandson--will astonish many Indians. That's not because the label itself is a misnomer, but because McDonnell was exercised by the death of one Welsh miner in 1910. In fact, Churchill has the blood of millions on his hands whom the British prefer to forget. "History," Churchill himself said, "will judge me kindly, because I intend to write it myself." He did, penning a multi-volume history of World War Two, and won the Nobel Prize for Literature for his self-serving fictions. As the Australian Prime Minister Robert Menzies remarked of the man many Britons credit with winning the war, "His real tyrant is the glittering phrase, so attractive to his mind that awkward facts have to give way." What Churchill was above all, though, was a committed imperialist--one determined to preserve the British Empire not just by defeating the Nazis but much else besides. At the start of his career, as a young cavalry officer on the northwest frontier of India, he declared the Pashtuns needed to recognize "the superiority of [the British] race" and that those who resisted would "be killed without quarter." And his principal victims were the Indians--"a beastly people with a beastly religion," as he charmingly called us, a "foul race." Churchill was an appalling racialist, one who could not bring himself to see any people of color as entitled to the same rights as himself. 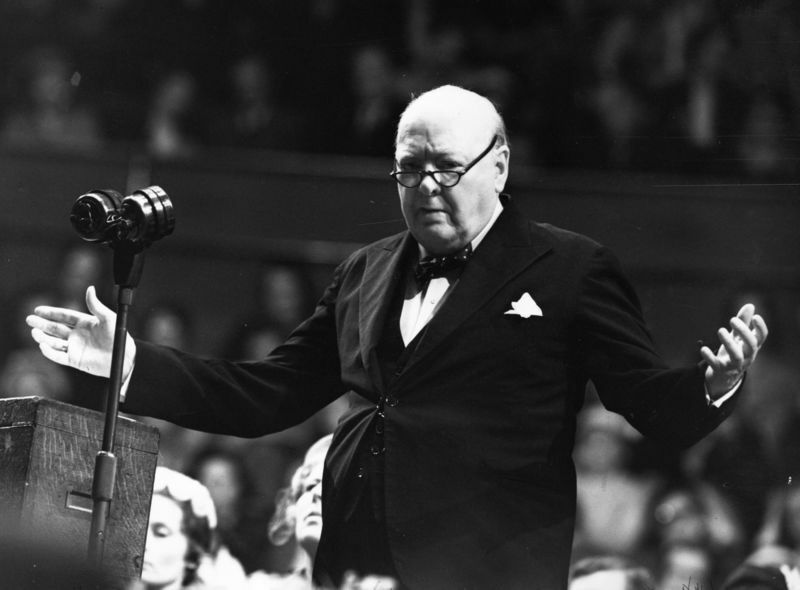 Thanks to Churchill's personal decisions, more than 3 million Bengalis died of hunger in a 1943 famine. Churchill deliberately ordered the diversion of food from starving Indian civilians to well-supplied British soldiers and even to top up European stockpiles, meant for yet-to-be-liberated Greeks and Yugoslavs. "The starvation of anyway underfed Bengalis is less serious" than that of "sturdy Greeks," he argued. In the beginning, love arose, which was the primal germ cell of the mind. The seers, searching in their hearts with wisdom, discovered the connection of Being in Nonbeing.